For the 1903 Tour de France – Stage 1 there were 79 riders entered in the race. Only 60 turned up at the start of which only 37 would finish the first stage into Lyon the following day. The stage started at 15:16. 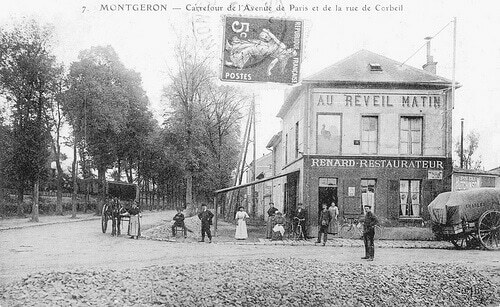 The riders raced through the night with the winner Maurice Garin arriving in Lyon at 09:00 the following morning. The last rider to finish would be 20 hours behind Garin. The bikes weighed about 12 kilos and were fixed wheel. The rear wheel had a sprocket each side. One big and one small. Riders would have to remove the wheel and flip it around and then refit it to change gear. As the wheels were fixed, they had to pedal down hill. Bikes were without lights and had one brake on the front. Riders had to carry all their own spares and tools. This is an approximation of the route. It is not 100% accurate. The following riders abandoned on stage 1. The following riders did not start.